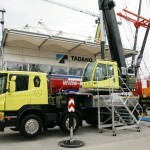 My second day on the Bauma construction fair started with a long visit of the booth of the German crane manufacturer Tadano cranes in the open air area. 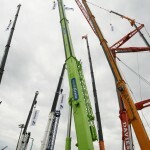 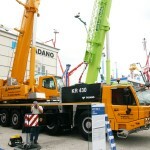 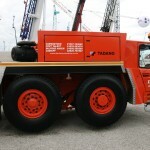 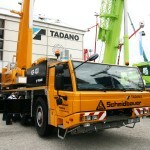 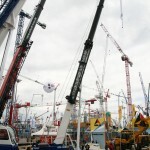 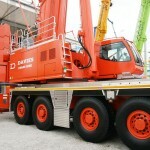 Tadano has the most mobile cranes on display after crane manufacturer Liebherr. 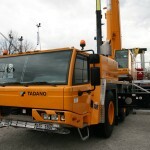 Most of the mentioned crane types are already known and, since Tadano offers the range of Global cranes, are working on lifting jobs for customers in many countries worldwide. 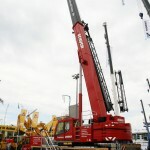 Two of the crane types from the product range are rather new: The Tadano ATF 180G-5 with a maximum lifting capacity of 180 t and the ATF 400G-6. 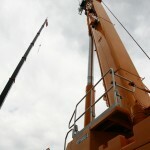 The latest all terrain crane in the Tadano family has a maximum lifting capacity of 400 metric t.
Described in simple numbers the ATF 180G-5 has a 60 m telescopic boom. 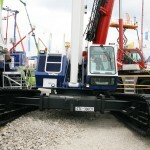 It can be equipped with an additional boom extension of max. 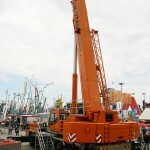 37,2 meters. 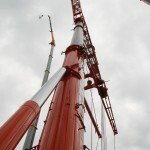 The lattice jib can be mounted with an offset of 0°, 20° and 40° mechanically. 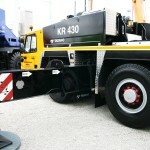 The hydraulic option allows the luffing between 0° and 40°. 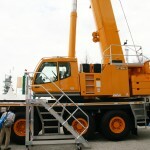 Also available is a completely hydraulic jib named HTLJ. 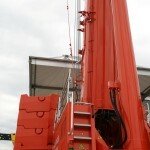 The HTLJ allows hydraulic luffing under load in a range from 5° up to 60° and a variable telescopic length from 8,5 m up to 20,9 m. Even under load the HTLJ jib can be telescoped. 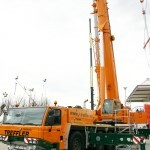 Not only the lifting configuration of the ATF 180G-5 is very interesting. 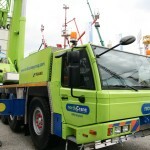 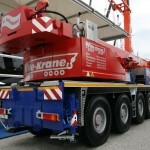 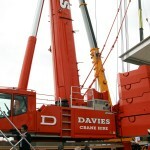 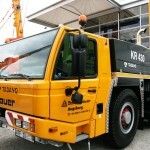 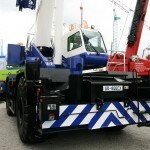 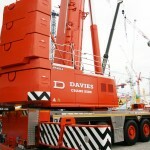 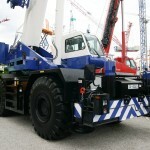 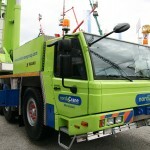 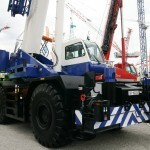 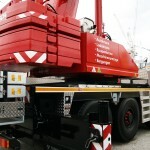 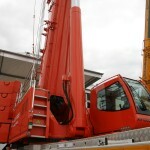 Also the transport configuration offers great value for the crane hire companies. 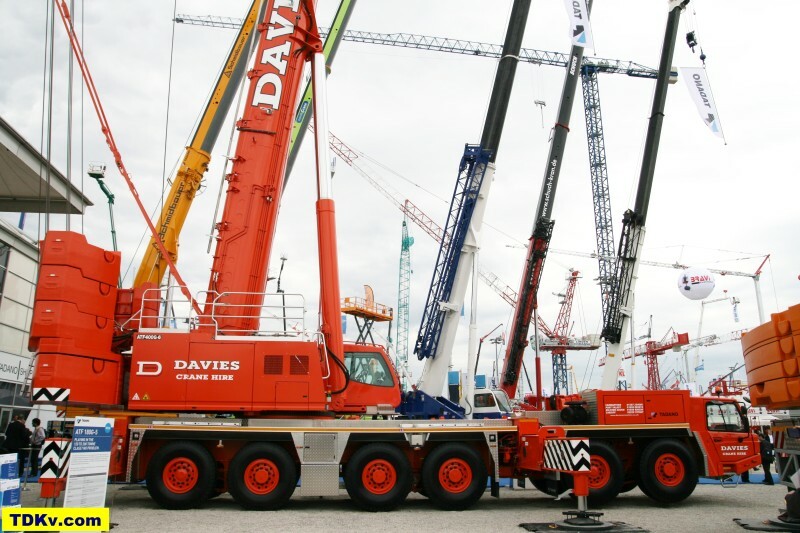 Equipped with 13,2 m boom extension, 25 t hook block, 10 t swivel hook, 10×8 drive configuration on tyres in the dimension 16.00 R25 the all terrain crane can be driven on public road within the axle load limit of 12t. 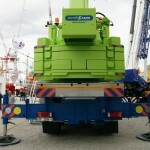 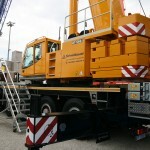 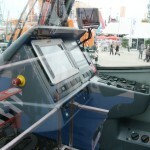 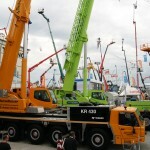 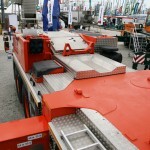 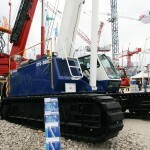 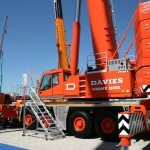 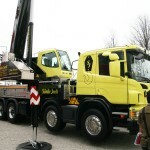 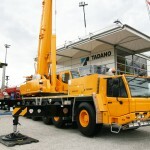 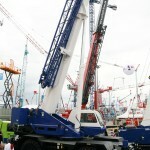 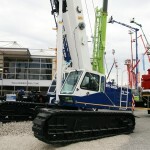 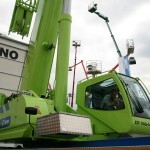 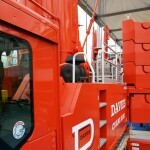 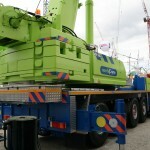 The impressive eye-catcher on the booth is the 400 t all terrain crane ATF 400G-6. 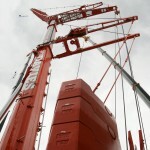 It is rigged with 118 t counterweight, attached PS Power system and luffing jib. 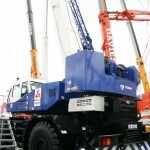 For the development of the ATF 400G-6 the Tadano engineers placed great emphasis on the creation of a “real” 400 t telescopic crane. 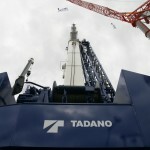 The result is, as Tadano claims, the strongest main boom of its class. 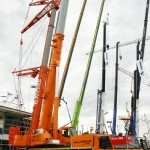 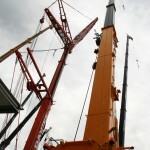 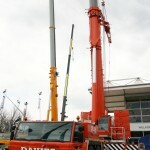 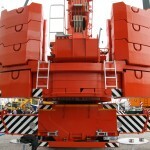 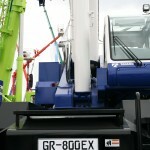 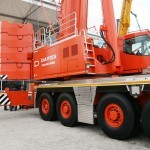 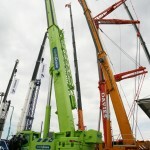 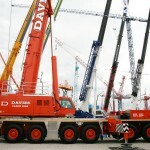 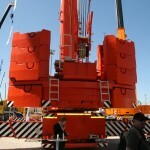 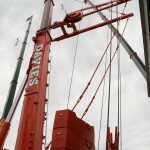 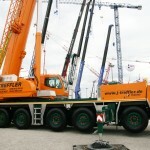 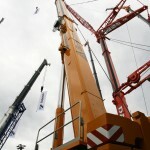 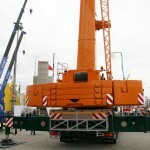 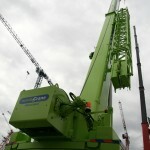 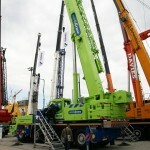 It offers lifting capacities on the main boom where competitor cranes already need to add a lifting enhancement system. 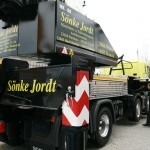 Another problem for the travel from job site to job site always is the axle load limit. 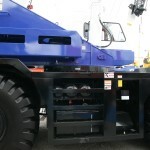 The ATF 400G-6 can travel within the 12t axle load limit with attached 12,5 t swivel hook, toolbox and 12x8x12 drive configuration on 16.00 R25 tyres. 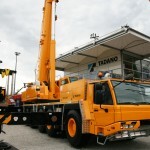 With the ATF 400G-6 Tadano has entered a new crane class and I’m rather confident that this crane will be a bestseller for the next years. 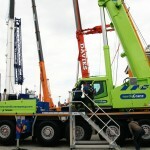 Below you find a large picture gallery of the mentioned Tadano cranes from the booth at the Bauma 2013 plus pictures of the displayed rough terrain crane GR-800EX, the HK 65 truck mounted crane and the telescopic crawler crane Mantis GTC-300EX. 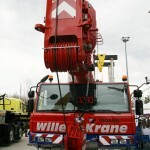 I hope you enjoy the crane gallery. 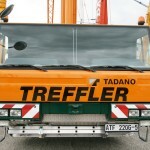 Please feel free to leave me a comment below the gallery.